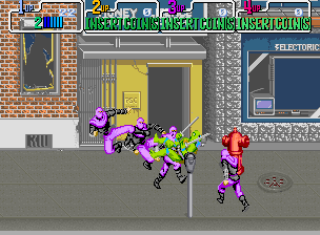 So, given my dislike of the subject matter, it’s a little annoying to find that this is a pretty decent quality scrolling fighter, and that in itself makes it a precious commodity, especially when you take into account the four-player mayhem it offers! It has its faults, and I’m sure fans will enjoy it more than I did, but it’s a solidly playable effort – entertaining in short bursts for a solo player, great fun with multiple players. As for controls it was pretty easy which was good because this was a button mashing boot-camp of a game. 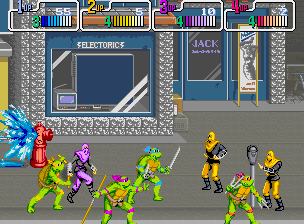 You had only two buttons jump and attack, but you could press jump and attack together to do a special move be it a jumping swing attack or like with Raphael a rolling attack. You could also throw the foot over head and if attacking a foot in front of you and another snuck up from behind you could pull of a quick back attack to send them flying.